Laura Ingraham’s comments are another reason why we need to have a national discussion on race, says Kevin Cullen. Basketball is not the national game, but it suddenly finds itself at the heart of a local and national conversation we should be having about race. If you take two recent examples — one local, one national — you will see the reason we as Bostonians, as Americans, very much need to have that conversation but also how different and sometimes conflicting perspectives keep driving people into corners with their fists clenched rather than leaving them face to face, with their palms open. 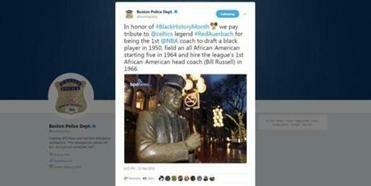 Locally, many people took offense when the Boston Police Department put out a tweet praising the late Red Auerbach as part of Black History Month. The BPD praised Auerbach for being the architect of great Boston Celtics teams that drafted the first black player, started the first all-black lineup in the NBA, and hired the first black coach in Bill Russell. But, according to many people, Black History Month was created to exclusively honor black folks, not benevolent white folks who did good things for black folks and the civil rights movement. This was news to the BPD. While those who got most upset might very well be absolutely right that the creation of Black History Month was specifically to honor black people exclusively, it’s not as if there is an indisputable consensus on this, even among blacks. The tweet noted Celtics legend Red Auerbach’s role in integrating the NBA. Aside from being an integral part of some great championship Celtics teams in the 1980s, Cedric Maxwell is black and Max said he was perplexed by the backlash. Max’s sentiments were echoed by no less a great man (who happens to be black) than Tom “Satch” Sanders, a similarly gifted member of those legendary Celtics teams in the 1960s who with Bill Russell at center and later at the helm as player-coach compiled a ridiculous number of NBA titles. In a video the Celtics prepared to commemorate Black History Month, Satch said that both Auerbach and Celtics owner Walter Brown were important pioneers in the civil rights movement and should be recognized as such. Walter McCarty, a Celtics assistant coach who played seven seasons for the Celtics beginning in the late 1990s, is also featured in the video offering props to Red. Some very good people, including Tanisha Sullivan, president of the Boston NAACP, and Darnell Williams, president of the Urban League of Eastern Massachusetts, were highly critical of the BPD tweet. They and former city councilor Tito Jackson, the city’s first black finalist for mayor since Mel King in 1983, were among those who denounced the tweet as being inappropriate and tone-deaf. The BPD apologized, but there seems to be a reservoir of frustration and resentment, on both sides, from people who thought the tweet was deeply offensive and from those who remain miffed that what appeared to be a genuine, sincere attempt to show respect was swatted away like a Bill Russell block of a lazy jump shot. What has followed has not been a real discussion as much as a conversation-stopping retreat to neutral corners. Reasonable people can reasonably disagree, but I was left especially confused by the insistence by some that the praise lavished on Auerbach was particularly undeserved because Auerbach had always insisted he made his decisions not to make a point, but to make the Celtics the best franchise ever in the NBA. My take is that Red Auerbach’s decisions to draft a black player, start an all-black lineup, and hire the first black coach were even more laudatory because the decisions he made were color-blind and based on merit, not specifically to make a point. But, in doing so, Auerbach made an indelible statement on equality. When he drafted Chuck Cooper, it was because Cooper was the best player available. When he put Willie Naulls in to complete the first all-black starting lineup, it’s because when he looked down the bench the next best player was Willie Naulls. When he made Bill Russell coach, it was because he believed Russell had what it took to coach the premier NBA franchise. Red Auerbach didn’t just embrace Dr. Martin Luther King’s dream of a day when we would judge people not by the color of their skin but by the content of their character; he lived it. We always say we want to talk about race in this town, but that conversation almost always ends not with earnest, long-lasting engagement but with narrow judgments and head shaking and hurt feelings all around. I know, I know. My white privilege is showing. I’m not nearly woke enough. I get it. But I’m trying. A lot of people are. They should be encouraged to engage, not so quickly judged as hopelessly blind or genetically incapable of change or appreciating the views of those who don’t look like them or have different life experiences. Some context: It was a white guy named Lieutenant Detective Mike McCarthy who came up with the idea for the BPD to commemorate Black History Month with a series of social media postings every February. The practice began two years ago when McCarthy took over the department’s office of informational services. One of the officers assigned to McCarthy’s office, Jamie Kenneally, is a sports nut. In fact, Kenneally left the Police Department years ago to pursue his dream of being a sports journalist and eventually became a sports reporter for the old Channel 56 newscast. But Kenneally missed the job and came back to the department. Before sending out the infamous Red Auerbach tweet, Kenneally sent out tweets that commemorated the achievements of Russell and Jordan Greenway, the Boston University forward who is the first black player to compete on the US Olympic hockey team. No doubt, some of the animus directed at the BPD is inextricably linked to the national concerns about the disproportionate use of force against young black men by police. And while that concern is genuinely necessary, the assumption that the BPD got the tweet wrong because they are somehow uniformly racist or insensitive seems very unfair and unfounded. If it is wrong to judge someone based solely on the color of their skin, it is equally wrong to judge someone based solely on the color of their uniform. In my experience, McCarthy and Kenneally are pretty good dudes. Their commanding officer, the most senior uniformed officer in the city, happens to be a black guy named Willie Gross, and they would run through walls for Willie Gross, as would almost every cop in the city. At community meetings with advocates and activists from the city’s black and brown neighborhoods, Gross has gone out of his way to praise McCarthy for showing the initiative to start the BPD’s Black History Month commemorations, whether that’s noting the service of the department’s first black officer, Horatio Homer, or praising those who have done much to advance the causes of diversity and mutual respect. As for the critics of the BPD, I’m not saying they are wrong: I’m saying there has been a depressing lack of context provided for what actually happened and why the controversy and head-shaking cynicism contributes to driving well-meaning, decent people back to their familiar, comfortable corners instead of promoting a genuine, respectful two-way conversation about race. Some will dismiss me as an apologist for the cops, but that’s not what I’m trying to achieve here. I’m trying to explain why people of good will, and I’d like to include myself in that category, sometimes find it easier to shrink from that conversation than engage it head-on. Marty Walsh has been talking, I think genuinely, about getting people in this town to engage more openly and respectfully about race. The whole contretemps over the BPD tweets seems to me worth its own forum. Book the Strand, Marty. You’ll have a full house. Which brings us, even more depressingly, to the national example of basketball and race. Last week, the Fox News host Laura Ingraham decided that she didn’t appreciate basketball players like LeBron James and Kevin Durant expressing their opinions about politics. She said they were inarticulate, a well-worn slur used against black men, especially. And she wrapped this all in a catchy, sound-bite reproach: Shut Up And Dribble. Clever, even for a Dartmouth grad. But, then, not especially original because it’s a variation of a book she wrote called “Shut Up And Sing.” That barb was aimed at the Dixie Chicks, because they had the temerity to go on stage in London and say they were embarrassed to be Americans at a time after George Bush and his administration started a war on false pretenses. Fast forward to today, and Ingraham was upset that LeBron James and Kevin Durant are embarrassed to be Americans when Donald Trump has turned the White House into a playpen for the dumb and the dangerous. I’ll give Ms. Ingraham this much credit: She managed to leave the word “uppity” out while denouncing James and Durant. Again, a magnificent achievement. Ingraham sounded wounded when many people accused her of being racist or, at the least, racially insensitive. She invited James to go on her show. Some of Ingraham’s critics were horrified by that prospect. Why, they ask, should somebody like Ingraham get a ratings boost after she threw some racially charged shade at the world’s greatest basketball player? I see it differently. I think it would be pretty awesome, and enlightening, to see Laura Ingraham and LeBron James have a frank and open discussion about, among other things, race in this country. She could tell James that, as a classically trained lawyer, she knows the Constitution very well and that the Constitution forbids anyone from expressing their opposition to a president they think is leading the country down the wrong road and is dividing not uniting Americans. Oh, wait. Actually, the Constitution does just the opposite, protecting Americans’ right to express dissent against presidents and anybody else in the government. There is nothing more American than dissent. But, still, it would be fun to watch her try to actually tell LeBron James to shut up and dribble. James, meanwhile, is more thoughtful than most of the talking heads on TV. He could explain to Ingraham why Trump’s repeated and pointed criticism of black athletes for not standing during the national anthem as the president would have them comes off not as a defense of patriotism and the American flag but as an unseemly suggestion that black men, especially accomplished, rich athletes, should know their place. I’d pay big money to watch that. That’s a conversation that could produce ratings of biblical proportions. The King James version, naturally.